Your digestive system plays a crucial role in your healing process. This complex series of organs and glands break down the food you eat into nutrients that your body can absorb, using them to provide energy, heal and fight off disease. It then releases the toxic waste your body doesn’t need. As a result, it is essential for those with chronic illness and disease to pay close attention to their digestive health as a part of their healing process. The foods you eat, your stress level and overall health all play a role in the effectiveness and health of your digestive system. This has been known since ancient times. The two oldest systems of medicine, traditional Chinese and Ayurveda, both focus on digestion as one of the key factors that influence heath, directing their healing efforts on the link between a person’s digestive system and their mental and physical well-being. Improve your gut flora: Your gut flora is made up of microorganisms that live in the digestive tracts and help your body digest and absorb nutrients and fight against intruders. Healthy flora is critical for whole body health. Your body cultivates new flora every 24 hours through the foods you eat. This healthy bacteria that lives in your intestinal tract thrives on colorful, plant-based foods such as cruciferous vegetables, bananas, beans, Jerusalem artichokes, blueberries, polenta, kimchee & sauerkraut and tempeh. 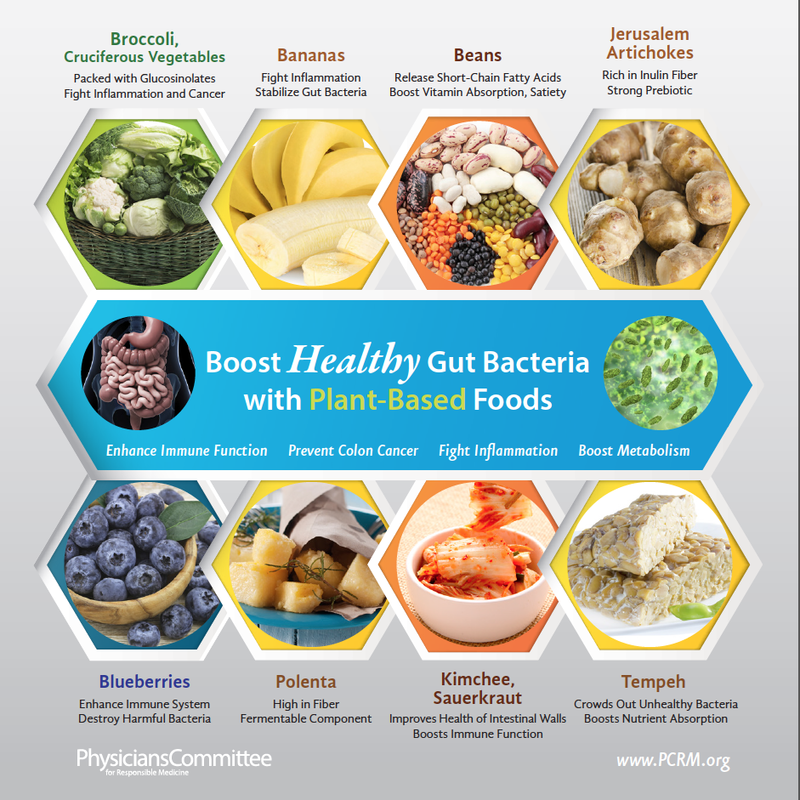 PCRM has created a wonderful infographic that shows the properties of these foods that support healthy digestion titled Boost Healthy Gut Bacteria with Plant Based Foods. Learn more about how to restore your gut flora. Eat plenty of fiber – Fiber is important in maintaining regular bowel movements so toxins don’t build up and become reabsorbed into your body. Fiber is found in vegetables, fruits, grains and legumes. There are two kinds of fiber: Soluble fiber (i.e oatmeal, nuts, beans, apples and blueberries) slows down digestion as it breaks down into a gel in your intestines Insoluble fiber (i.e. seeds, grains, stringy parts or skins of plant matter) speeds up digestion as it passes through the body mostly intact . It is important to have both types of fiber in your diet. Drink plenty of water – water helps your body flush out toxins through your digestive system and softens stools. Fiber, like a sponge, absorbs water. A high fiber diet without enough fluid intake will cause constipation, resulting in the malabsorption of nutrients and the reabsorption of toxic waste that was delayed in being removed from the body. Manage your stress – when under stress, your body experiences the “flight or fight” response causing your central nervous system to shut down blood flow, this affects the contractions of your digestive muscles and decreases secretions needed for digestion. Stress can also result in inflammation of the gastrointestinal system. Some useful tools for distressing are: exercise, yoga, meditation, visualizations, deep breathing, spending time with friends or family, laughter, or communing with nature. Find what works for you. It can be as simple of learning to give yourself a “time out” when feeling overwhelmed to scheduling “me” time everyday to enjoy an activity you love. Learn more about stress and digestion. Exercise regularly – Aerobic exercise increases your breathing and heart rate, helping to stimulate the natural contraction of intestinal muscles. This doesn’t mean you should perform aerobic exercise after a large meal. Because digestion requires a large amount of blood flow, strenuous exercise right after a meal will stop digestion by redirecting the blood flow to support the increased need for physical activity. Instead, consider enjoying a slow leisurely walk which can actually stimulate digestion and relieve bloating. Take time to enjoy the your meal – When you eat too quickly your food is not broken down as well by chewing and the acid-neutralizing saliva that helps the food pass into your stomach is significantly diminished. This creates the perfect environment for heartburn and indigestion. Lingering over a meal with friends and family, chewing carefully and eating mindfully are important steps in creating healthy digestion. Sip on ginger tea. Ginger’s ability to relax the intestine muscles has made it a popular cure for stomach issues. However, it does so much more. According to the Chopra Addiction and Wellness Center, “a recent study in the European Journal of Gastroenterology and Hepatology found that ginger stimulates digestion by speeding up the movement of food from the stomach into the small intestine, and helps eliminates digestive discomfort after eating. In addition, ginger can stimulate saliva, bile, and gastric enzymes to aid in digestion of the food that has been ingested. “ They suggest drinking ginger tea regularly throughout the day by adding one teaspoon of grated or sliced fresh ginger root to a cup of hot water. This entry was posted in Nutrition, Plant-based, Vegan, WFPB, Whole food, Whole food, plant-based and tagged Digestive health, eating healthy, gut flora, healing with plant-based foods, healthy living, plant-based diet. Bookmark the permalink.